Some people are lucky enough to know at an early age what their passion is and Carly is one of those people. Whilst at school she was making the most of the family video camera to create her own films. This passion fueled her desire to work in the television world and Carly carefully crafted her path very precisely to ensure she had maximum opportunities to gain experience and knowledge. In our interview Carly tells us about her early work experience, how hard work and networking opened doors that led to her current role of junior editor at Whisper Films and about her work at the production company. How did your interest in the media begin? I always loved making films - when I was younger I would borrow my dad’s video camera and force family, friends and even my toys to star in my productions. Despite my mum’s protests that my shaky camerawork made her feel ill (something I have hopefully now rectified! ), I wasn’t put off and took on my first semi professional project aged 17, making a film for my school. Did you have a formal media-based education? Not at all. Even though I knew I wanted to work in television when I finished school, I was advised by various people that a good degree in a more mainstream subject would be just as useful as studying media. With that in mind, I applied to study English Literature at Southampton, and took a GAP year before starting, with a plan to use this year for TV work experience as well as travelling. How did you get your start in TV? I knew TV was a tricky industry to get into; plenty of people were keen to remind me of that whenever I mentioned that’s what I wanted to do! I think this made me even more determined to succeed. I was lucky enough to have an aunt who worked in media and arranged a week of work experience in a small TV production company in Soho. I did this whilst still in 6th form, and loved the experience, even though I was mostly making tea, tidying the stationary cupboard and buying toys for the company owner’s dog! I must have impressed them with my overly keen nature and willingness to take on anything, and I was invited back for another week of work experience later that year. This meant by the time I was applying for TV work on my GAP year I had already got a few things on my CV, which helped me get a full time runner job at a Post Production House in Soho. Once again, this consisted of plenty of tea making and running tapes between production houses, but I also used the time proactively. I sat in with producers and editors whenever I could, and spent time in the machine room learning the tape decks and the library learning the archive system. By the time I left 9 months later I had a solid grounding in the world of post-production, along with basic editing skills in Avid and FCP7. I also made friends with plenty of producers and editors and several of these recommended me for small bits of work as both runner and edit assistant in the years to come. This meant that whilst I was at University I kept up my practical work experience and gained more ‘credits’ on my CV. How did being the station manager at Southampton University TV help your career? When I arrived at Southampton University, I obviously wanted to do well in my English degree, but it was just as important to me to take on extra-curricular activities, especially if they were linked to media. As Southampton didn't run any kind of practical filmmaking courses, the Union had invested in a volunteer run department: Southampton University Student Television society (SUSUtv). We had industry standard cameras, edits with FCP7 and a live online streaming set up which allowed us to do multi-camera broadcasts. I joined SUSUtv in freshers’ week and it became a big part of my university experience. I spent as much time doing this as my English degree, which probably wasn't advisable, but the skills I learnt were invaluable. When I left my runner job in Soho to come to university, I was sure I wanted to be an editor. On joining SUSUtv, I realised there was so much more to try out, and I ended up directing, producing, filming and even presenting (I was terrible, but it gave me a little insight into that role and helped me as a director/producer for future projects!). In my final year of university I was elected as Station Manager and was responsible for running the department and looking after 40+ volunteer members. My highlights of SUSUtv include producing and directing an 8-camera live broadcast (across 2 streams) for our Union Election Night, and raising £6000 for a medieval period drama shot in multiple locations, including a castle. At the National Student TV Awards I won ‘Best Drama’ and ‘Best Live Show’ in 2011 and 2013 respectively. Whilst none of this was ‘professional’, I gained confidence and experience working with large crews on big projects, and my love for producing films increased. We did all of this as volunteers and for some of these productions we worked 12+ hour days. I think this prepared me for getting a proper job in telly and the demands involved, especially the long hours. I also got used to taking on multiple roles (often shooting and editing my own projects), something which has helped me in my professional career. You’re now a junior editor for Whisper Films. How did you land this role? When I left university, I ended up in a range of roles: runner, data wrangler, logger, researcher and edit assistant. I found one thing always lead to another and my work varied from broadcast shows on BBC and C4 such as “The Choir: Sing While You Work”, “The Jump”, “The Jonathon Ross Show”, “First Dates” and “Gogglesprogs”, to branded content for clients such as Burberry, Red Bull and the Edinburgh TV Festival. I had worked as a researcher for the London Olympics in 2012 and this began my experience in sports television. From this I went on to work at a cycling production company, where I honed my filming and editing skills whilst travelling the world producing race coverage - the highlight being the Women’s Tour of California. I loved being able to shoot and edit my own footage, but I wanted to progress as an editor and start working on some higher profile television, and that was when I was offered the job at Whisper Films. This was through a friend of a friend who passed my CV along - as I find most TV jobs are. Tell us about your work there? When I joined Whisper Films as edit assistant it was a small company (around 8-12 permanent staff members). Almost 2 years on and the company has tripled in size and I have been promoted to junior editor and have loved the opportunities that have been given to me. The growth of the company was aided by winning the Channel 4 Formula 1 coverage (just a month after I joined), and this has led to plenty of other sports contracts. 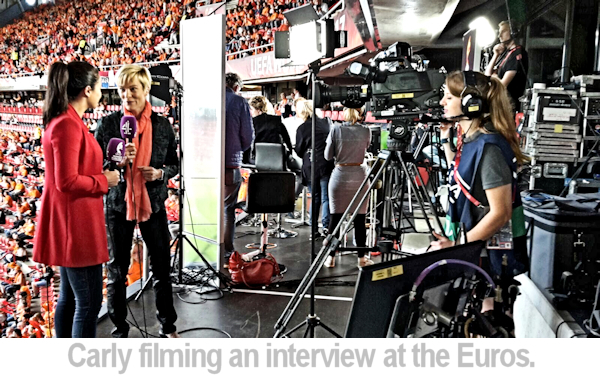 Whisper produce NFL highlights for BBC and this year has started specialising in women’s sport, producing both Women’s Six Nations for BBC and Women’s Euros for Channel 4. Alongside broadcast work they also produce a variety of branded content, for clients including Red Bull, Casio, UBS, Nissan, Jeep, Hyundai and Heineken. "Take every opportunity which comes up, even if it’s not in the genre/role you eventually want to do" What does a typical day look like? The majority of the time I am in the edit with a producer, but I also go out on shoots as second camera. I love the variety of projects I get to work on. One day I will be editing a feature for our Channel 4 Formula 1 coverage, the next I am out shooting a branded content film. I also work on a lot of in-house showreels and pitch films, including successful bids for the Women’s Euros 2017 and the Winter Paralympics 2018. I have been given the opportunity to travel with Whisper Films, and this year I’ve been to the Super Bowl in Texas, the Women’s Euros in Holland, and Formula 1 in Singapore. These have definitely been career highs. Whilst the days on location are always long, there’s nothing like the excitement of turning around content and seeing it go to air moments later. In the Euro’s I was editing VTs during the day and then during the match I would go out and film fan shots and slow motion beauty shots of the game and players. This meant my days were full on and I had to switch mindset from editing to shooting very quickly, but I loved being able to get out of my edit and experience the game and atmosphere for myself. The tricky part of the job is working on pitches that we don't win, or client films that get cancelled before completion. There’s nothing worse than working really hard on a project and it never seeing the light of day. What have you learnt on the job that college or university didn’t teach you? Working with clients is a something which university and my time in SUSUtv didn't prepare me for. Making a film for a client is often a lengthy process and some of the projects I work on go through up to 15-20 rounds of feedback in the edit. This is often mind-numbing and you end up going round in circles trying different things in the edit. It demands a very precise kind of editing. What opportunities are there to progress in your career? Whisper Films is brilliant for encouraging and helping aid career progression. This year they arranged a bespoke advanced editing course for me to go on, which has helped me improve my grading and audio work. 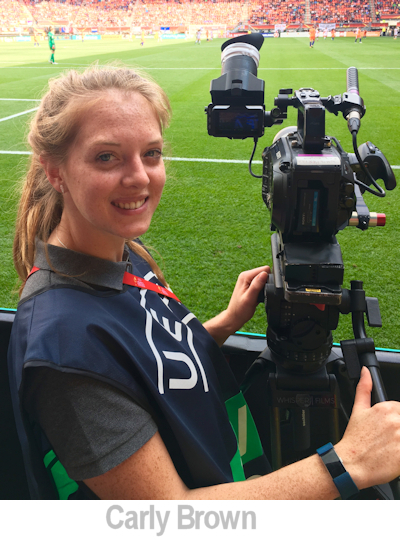 I have also been given opportunities to work in high pressure environments, such as editing closers and round up VTs for the Women’s Euros and Formula 1 whilst live on air. Whisper Films have a few long form documentaries in the pipe line, and I think working on these will help my career advancement. Whilst filming is my secondary skill, I would like to continue to improve my shooting skills and learn from other experienced camera people who work with Whisper. What was the best career advice you were given? Bring tea and biscuits and you’ll be remembered! Do you have any advice for anyone wanting a career in the media? Take every opportunity which comes up, even if it’s not in the genre/role you eventually want to do. TV is a small world and you never know who you will meet and where it will lead! Whilst you will probably need to start as a runner, learning practical skills such as basic shooting and editing will mean you can progress faster. All images © Carly Brown and used with permission. Want more,more more to read? Dan James is a broadcast editor who puts together films for high-profile tv programmes like the BBC's Top Gear. Dan talks to us about his career, how he started and what an editor does. 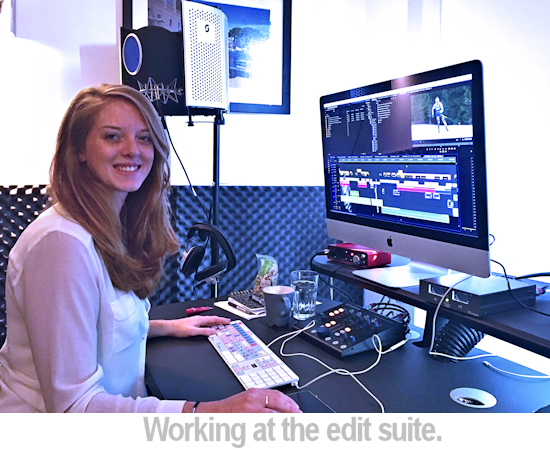 Megan is an editor with 20 years experience working on high profile movies like Eye in the Sky. In our interview Megan tells us what it takes to be an editor.